The purpose of injection lines is to transport the fuel from the injection pump to the fuel injectors of the combustion engine. In doing this it is important that the injection lines operate without a loss of pressure and without a restriction to the flow. 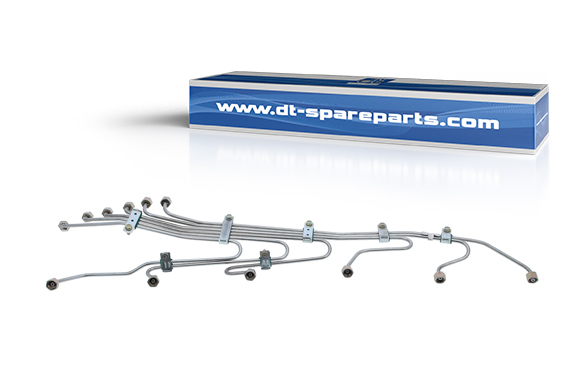 The injection line set 3.92001 of the DT Spare Parts brand is characterised by its precise curvature, optimal fit and proven steel quality. The injection line set 3.92001 comes pre-assembled with clips made of heat-resistant Viton. A mount with forged nuts ensures a secure fit to the corresponding attachments. It is important that the line set is installed free from tension. To do this, the attached assembly components must be partly disassembled. The individual lines should not be disassembled, it is possible to install the line set when complete. 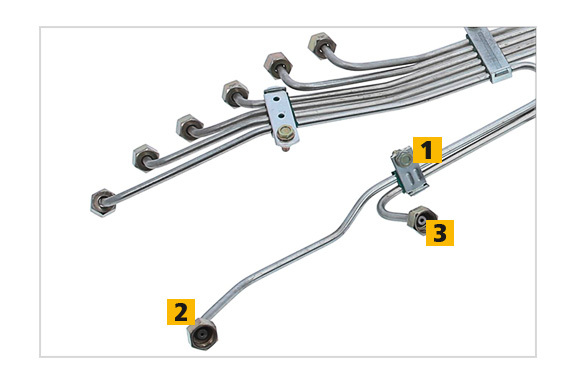 All of the injection lines’ installation nuts should be installed by hand in order to avoid tension. The line set must not be bent, this would result in internal damage to the lines. The mounting bracket should be appropriately adjusted after installation. The final test drive serves as a leak test.